After upgrading to Xfce 4.10 all items on the Xfce panel were align to the left. 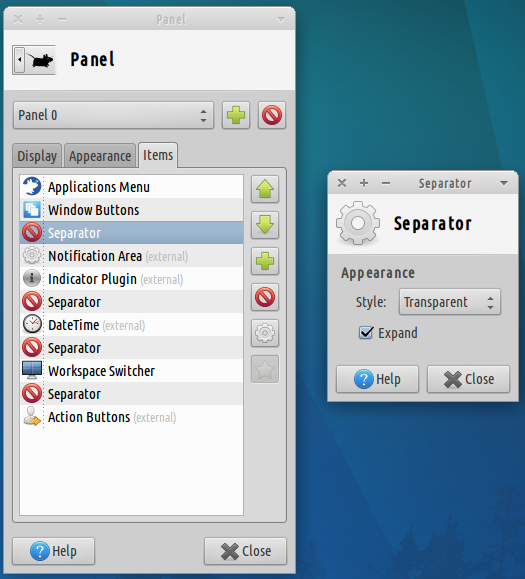 This happens because in Xfce 4.10 the "Window Buttons" panel item no longer expands, one has to add a separator and set this separator to expand. Hi great post. Really helped me. By the way, what font is that you're using? Thanks. The font is 'Ubuntu Condensed'. I'm sorry for the off-topic question, but do you know how to make app shortcuts in Xfce Panels open an already running app ? For example, if Chrome is running, I want the app shortcut in Xfce panel to open the running Chrome, not open a new window.. If it's possible I don't know how. A while back I was seeking for this functionality and installed AWN (Avant Window Navigator) and ended up replacing all panels with this dock.